I’ll admit that I was unaware of how recently post secondary degrees became available to women in western history. We’re all pretty well informed of the Suffragette movement but the Bluestocking movement (which has its origins all the way back to the 18th century) was something I was unaware of until I saw Stage Centre’s latest production. Focusing on Girton College, the first women’s school in Cambridge but lacking full college status, the play follows the school’s attempts to achieve full accreditation while its students deal with the day to day of student life as outsiders within the patriarchal society of British education. For the women at Girton during Queen Victoria’s reign their diplomas wouldn’t get them jobs or respect, they were simply indicators that they had an education. The play spends a great deal of time holding this up and asking the characters (and the audience) if education and knowledge are a reward in and of themselves. I enjoyed these moments within the play and felt the enthusiasm of the actors really shone through. Unfortunately I found the conversation of gender equality a little less satisfying; it feels all too often these days that unless one says certain phrases or performs certain actions then they’re not ACTUALLY perceived as prejudiced or bigoted and therefore when depicting things like sexism or racism the perpetrators have to be almost caricatures. This is the case through a lot of the play and I felt it came off as almost comical at points. One part I DID enjoy, however, was the conflict between Education and Suffrage, where characters would argue over whether the Suffragette movement should be attached to Girton’s search for certification because Women’s Suffrage was seen as “too radical”. I really enjoyed this because it showed how entrenched systemic oppression is and how even those trying to fight against it can still be agents of oppression. The set of the production is quite impressive; relying mostly on furniture and lighting but these are used quite effectively and easily create a sense of place and mood without becoming too cluttered and preventing the actors from moving around as the story required. I saw the show on opening night and I have no doubt things will improve as the cast becomes more confident with the material but the performances were noticeably low energy at points and on a few occasions that low energy hurt some scenes that required a lot more emotional impact than what we got. One place that didn’t suffer, however, was the smaller scenes between the students. It is very clear that the cast members have built a comfortable rapport with each other and throughout the show the sense of camaraderie and friendship that comes from the educational experience really shines through, keeping me engaged with the characters and their stories throughout. 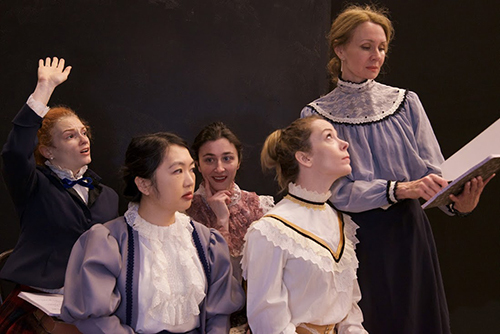 While it may not be as complex as I would have liked it to be, Blue Stockings is a very engaging snapshot of a period we seem to have collectively forgotten and one that opened my eyes to some things I hadn’t considered, and if you’re looking to learn something it’s worth taking a look. Blue Stockings is playing at the Fairview Library Theatre (35 Fairview Mall Drive). Performances run until March 30, 2019. Showtimes are at 8 pm with 2 pm matinees on Sundays, no showings on the 25th or 26th. Tickets are $25 – $30. Photo of Nikki Hogan, Olivia Jon, Lindsay Woodford, Kimberly Wells and Heather Goodall provided by the company.